Wake up all the teachers time to teach a new way. 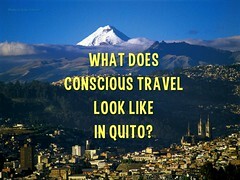 Conscious tourism is the philosophy favored by Planeta.com. Simply put, it's traveling with one's conscience and connecting with others in a particular place. Empathy meets exploration. Conscious travel is neither abstract nor anonymous travel. Rather conscious travel encourages a deeper understanding of people and place. The concept recognizes the fact that visitors and locals engage with one another in a multitude of fashions. Could we expand our awareness of the social and environmental footprint of travel and tourism? Too often tourism officials label the visitor without adequately inquiring about their interests. For example, the adventure traveler may also be a craft buyer and a birder, but I have been invited to meetings in which the tourism officials have emphatically stated that 'adventure traveler are not interested in culture.' 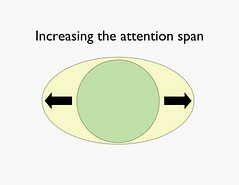 Faulty information about the visitor leads to poorer experiences for everyone involved. Conscious travel occurs when we are aware of our individual and collective actions as visitors and locals. We allow ourselves to be inspired by others and in our gratitude we acknowledge the good work of those around us. To use a Maori phrase (and the title of a photo exhibition at the 2007 Ecotourism NZ Conference: Manaki Whenua, Manaki Tangata, Haere Whakamua (Care for the land, care for people, go forward). Businesses are connecting in new ways with visitors. There is a difference beween bums on seats and minds in gear. Slow travel and slow adventures are key to making this conscious revolution throughout the economy. 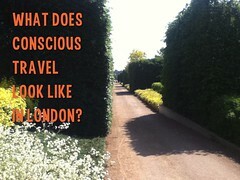 For related ideas, keep an eye on Anna Pollock's work related to Conscious Travel. A conscious host understands that their underlying purpose is to create the conditions whereby a guest experiences some form of highly personal, subjective transformation. Their experience makes them a better person.